The nationally respected Comprehensive Heart Valve Repair Program at Montefiore Medical Center is widely recognized for its expertise in treating patients with the most complex valve disease. 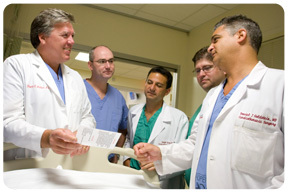 The Heart Valve Repair Program's renowned physicians and surgeons use the most advanced diagnostic and treatment techniques to care for patients with conditions of the aortic, mitral, pulmonary or tricuspid valves. The Heart Valve Repair Program's experts are particularly experienced in the management and treatment of patients with coexisting medical conditions, such as lung and kidney dysfunction, chronic lung and kidney disease, atherosclerosis, chronic obstructive pulmonary disease (COPD) and renal failure. Patients play an integral role in their treatment at the Heart Valve Repair Program and are involved in every decision regarding their care. Enlists patients in research protocols that explore novel treatments to improve patients' outcomes. At the Heart Valve Repair Program, senior members of the medical and surgical teams meet simultaneously with patients to evaluate their condition. This close collaboration allows for the development of a coordinated treatment plan that is tailored to best serve the patient. Additionally, each patient case is reviewed closely by senior physicians to ensure optimal care. The Heart Valve Repair Program's team approach sets it apart from other programs and helps to increase patient satisfaction and overall quality of care. The efforts of the Heart Valve Repair Program are supported by Montefiore's advanced imaging program, which combines highly skilled specialists with the latest technology to achieve accurate diagnoses. This program is among the largest and most respected in New York and offers a full host of imaging studies, such as computed tomography, magnetic resonance imaging and 3-D transesophageal and exercise echocardiography. When a patient's condition requires that a heart valve be repaired or replaced, the Heart Valve Repair Program offers a complete range of interventional and surgical procedures. Heart Valve Repair Program specialists are committed to preserving and repairing heart valves. When replacement is required, the full spectrum of mechanical, biological and human (or homograft) valves is available. Valve surgery is typically performed using the most minimally invasive approach available unless precluded by the patient's physical condition and age.